Formation Zone clients, TruVision VR, have been shortlisted for Start-up Business of the Year in the Herald Business Awards 2017. TruVision VR, which is run by Plymouth University graduates Connor Handley-Collins and Gary Roberson, are one of the UK’s leading virtual reality studios, providing high quality, quick turnaround and cost-effective VR solutions for the construction industry. Working with architects, property developers, and interior designers, TruVision VR’s clients have included such illustrious names as HAB Housing, which was set up by Grand Designs’ Kevin McCloud. 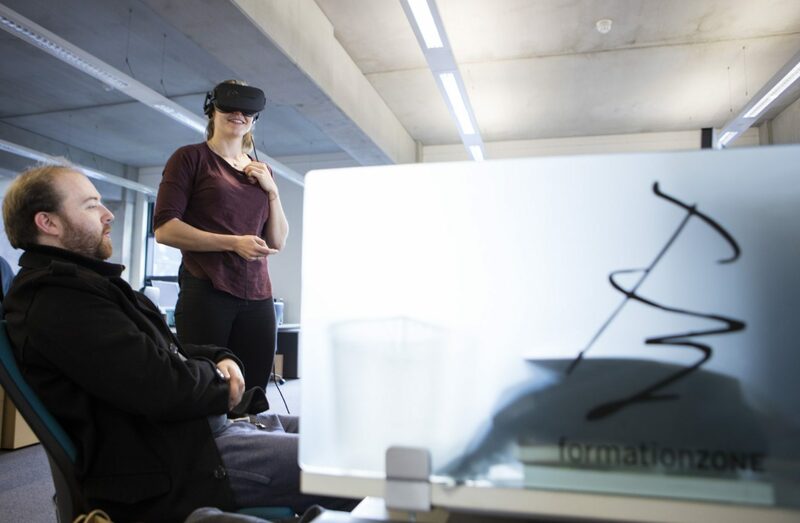 As well as creating houses in VR for HAB Housing, the team have also produced VR experiences of some of Plymouth University’s most striking buildings, including The House, the Roland Levinsky Building, and the Marine Building, where TruVision are based within Formation Zone. TruVision VR’s nomination is not the first for a Formation Zone client in the best start-up category, with So Good Studios narrowly missing out on the award last year. Let’s hope that this year TruVision can bring home the prize! You can see a full list of the nominees for the Herald Business Awards on the Plymouth Herald website.